Tags: Bill Y, Catherine, clowns, Dylan, Dylan is what happens when parents listen to Leonard Cohen..., funny, ghosts, Halloween, humor, Humor Outcasts, Humor Outcasts Bill Y Ledden, humour, I like tags, itsgoodtomock. 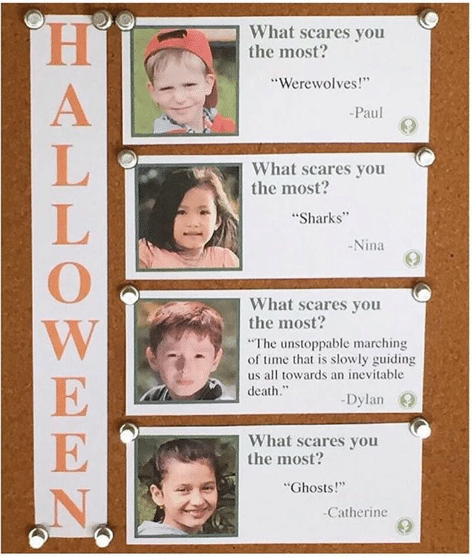 @itsgoodtomock, Nina, Paul, sharks, Tags, The unstoppable marching of time that is slowly guiding us all towards an inevitable death, werewolves, What scares you the most? Now you made me all depressed and I’m going to have to lock myself in the closet with my blankie……. Eh, you can blame Leonard Cohen for this – Bill Y has nothing to do with it! i know, debs! I know! Clearly “Dylan” is just one of your aliases. Is this your 3rd-grade photo? That will teach me not to try and pull the wool over your eyes again.